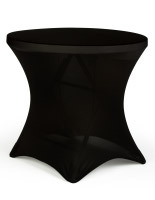 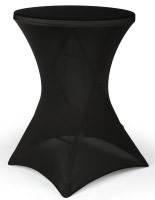 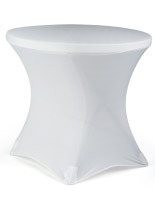 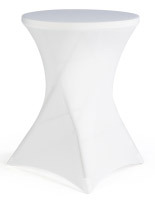 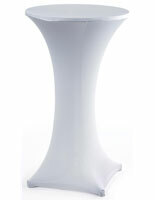 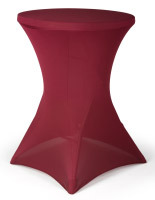 What do these stretch table covers have to offer in a banquet or exhibit setting? 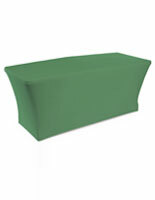 These fabric overlays can be purchased plain in white, black, green, blue, or red, or with full color imprinted logos on vinyl. 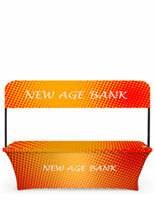 This alternative is preferred by businesses looking to underscore messaging and reinforce brand at an event. 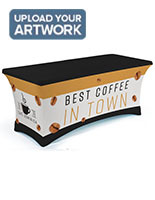 Custom printed stretch table covers, trade show tablecloths, are used to decorate a booth or showroom and to provide a backdrop for samples or catalogs. 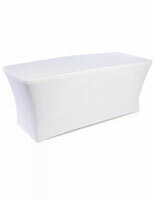 The convenience of fitted supplies is that they don’t require ironing or straightening - area always looks neat. 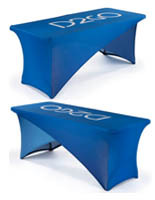 These stretch table covers, also known as trade show tablecloths, can be ordered with a full color graphic on vinyl (front, or all sides), depending on preference. 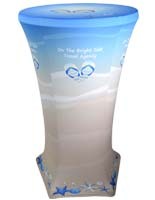 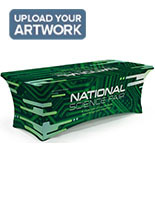 The custom skirts for exhibits can be used again and again, and thus are affordable! 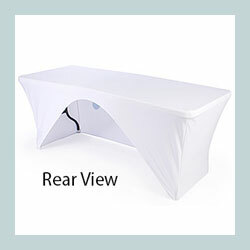 Each of these stretch table covers that are fitted are affordable, with 70 percent polyester cloth and 30 percent spandex. 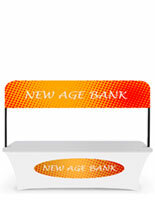 Where can trade show table cloths be used to best advantage? 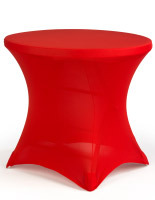 What features make these stretch table throws stand out from the competition? 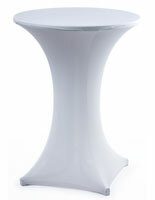 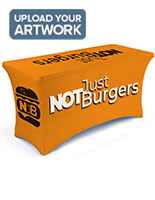 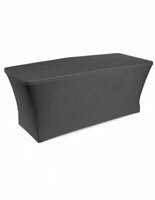 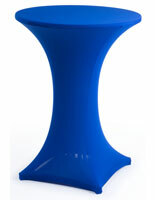 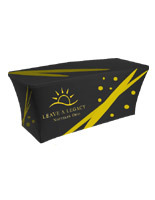 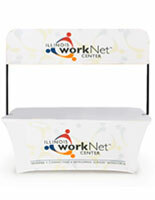 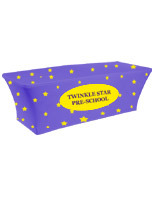 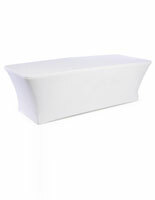 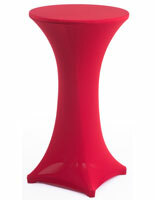 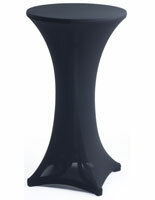 The tabletop skirts is designed to provide a neat display for selling wares and services in a credible fashion! 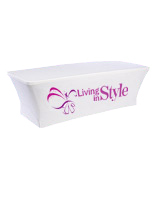 Shape: contoured shape doesn’t need clips or pins! 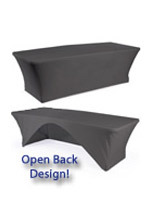 Materials as durable as these covers are meant for long-term use, which saves your company money! 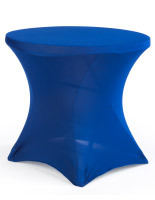 When purchasing stretch table throws lots of things get taken into consideration, from color, to size, to material - and whether or not custom graphics are in order. This quality sheath for tabletops is available in standard black, white, red, green, and blue, OR order with custom images and send us the text so we can personalize your message or company logo - available in multi-colors! 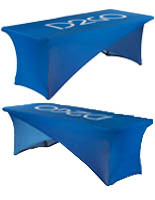 Choose these table covers made of material that stretches to prevent wrinkling and blowing away, for office meeting rooms or sales events in or outdoors. 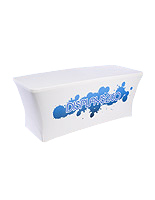 Our merchandise fits any occasion or budget - and we’ve got the best prices for printed supplies anywhere!